It was a long today , and cooking had to be super fast. I first hesitated to prepare a citrus flavoring for tofu , thinking it would not lift out the blandness of this very basic ingredient. I was surprised to learn that all the flavorings did work as intended, and gave the Tofu cubes a pleasant taste , and crispness. Between the lemon, thyme seasoning and delicate taste of the orange pepper slices, the dish did manage to come to life. It will be making the list of my repeat recipes for "faster foods" out of my kitchen island. Simple to make. Heat oils , garlic and thyme. Toss in Orange Peppers, then toss in Tofu , Season with S/P . It is ready when the Tofu is slightly browned. Sprinkle with lemon juice towards the end of cooking time. Garnish with lemon slices for your guests. I thought a room , temperature full bodied white would do the trick. Yes you read correctly , a WARM white wine. Nothing wrong with that. Break with tradition. 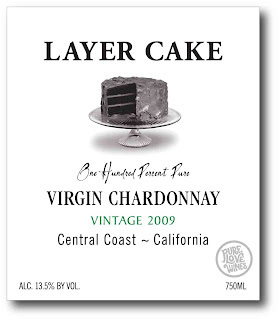 I selected a Layer Cake 2009 "Virgin" Chardonnay . It worked perfectly , accentuating the soft hints of citrusy lemon juice .